Why Good Design Is Finally A Bottom Line Investment. Apple’s rise offers a few important lessons about today’s connection between design and business. The easiest is that design allows you to stoke consumer lust–and demand higher prices as a result. You might wonder what design can possibly have to do with the success of a jet engine or an MRI machine. But hospitals and power plants are now linking their machines into ecosystems. And well-designed iPad apps are the simplest way to manage them. If [the designers] do their job right, the result–a working ecosystem–is a far better platform for innovation than an isolated product. Just think about Apple and how its products have expanded from iMacs to iPods, iTunes, iPhones, and iPads, all linked via its iCloud. Good designs seldom stay good for very long if they must navigate a gauntlet of corporate approval. That’s because the design process is as much reductive as anything else–figuring what can be simplified and taken out. Corporate approvals are usually about adding things on to appease internal overseers. When something has been approved by everyone, it may be loved by none. Just look at what happened to Microsoft in the 2000s and how only now is it trying to redefine itself by building a more design-driven culture. [N]otice what unites Pinterest and Microsoft: Ultimately, each company’s success hinges upon how well it intuits what users want and how much each pleases them with products. Only design has that power to seduce and delight. Now here is a beautifully designed cat. Happy Monday! 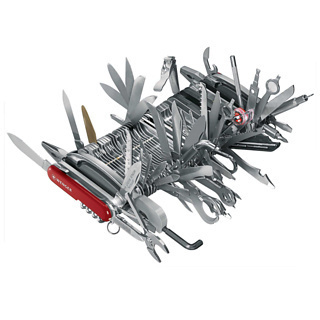 The Guinness world record for “most multifunctional” pocket knife belongs to Wenger, the company behind the storied Swiss Army knife. The company says the knife’s 87 gadgets (including a laser pointer, cigar cutter, and golf reamer) can be used for no fewer than141 functions. Alas, weighed down by its three pounds of gizmos, this “most multifunctional” knife has no practical function at all, a pocket knife that doesn’t fit in your pocket. This slice-n-dice Goliath was, of course, never really designed to be used. It was a novelty created for the company’s 100th anniversary, a whimsical project to bring together every gadget the company ever included in its knives. While the knife is obviously (and intentionally) ridiculous, it’s a winking reminder that somewhere in the reptile part of our brains, a misguided instinct tells us that more is always better. In the end, of course, the best gizmo is the thing that lets us do what we need to do with the greatest ease. Be ruthless when you consider every button and icon: Does this element invite attention? Is it clear what it does? Does it deliver something meaningful?